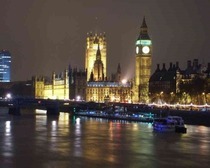 Big Ben, also known as Clock Tower, is one of the most popular structures people identify London with. Explore some interesting and fun facts about Big Ben. Big Ben is a chiming clock, located at the north-eastern end of the Houses of Parliament, in Westminster, London. Though the actual name of the tower is Clock Tower, it is often referred to as Big Ben, Big Tom or The Tower of the Big Ben. Clock Tower is one of the most recognizable structures in London and represents the city, just like Eiffel Tower signifies Paris. Since its inception, in 1859, it has served as the most reliable clock in London and also been a part of celebrations all year around. 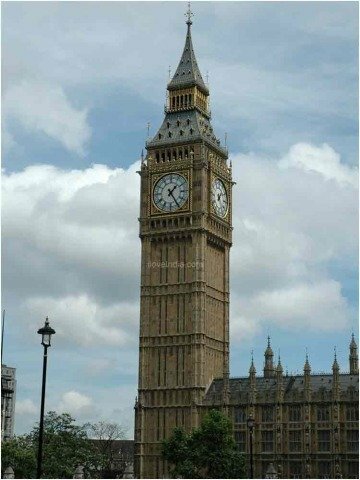 Explore some interesting and fun facts about Big Ben (Clock Tower). Big Ben is the biggest four-faced, chiming clock in the world. The real name of the tower, housing the clock, is 'Clock Tower'. Big Ben is the nickname of the main bell, formally known as the Great Bell, housed within the tower. However, the nickname is more popular than the official one. A survey of 2,000 people was conducted in 2008 that came up with conclusion that the tower was the most popular landmark in the United Kingdom. Clock Tower is also been referred to as The Tower of Big Ben and, incorrectly, St Stephen's Tower. However, the latter is actually the spired tower towards the middle of the Palace, which serves as the main point of entry for attendees of debates and committees. It is also called Big Tom. Big Ben was built to replace the Old Palace of Westminster, after it was destroyed by fire in October 1834. Big Ben was designed by Charles Barry. The clock and its dials were designed by Augustus Pugin. The first 61 meters of Clock Tower are made up of brickwork and stone cladding and the remainder of tower is made from cast iron. The Tower leans slightly towards northwest, by 8.66 inches. The bell of 'Big Ben' weighs 14.5 tonnes. It is the huge size of the bell that inspired Benjamin Hall to give it the name of Big Ben. The tower is sited on a 15-metre square raft, made of 3-metre thick concrete, at 4 meters below ground level. At the base of each clock face is a Latin inscription, in gilt letters. It reads - DOMINE SALVAM FAC REGINAM NOSTRAM VICTORIAM PRIMAM, which means "O Lord, keep safe our Queen Victoria the First". Clock Tower is the focus of New Year celebrations in the United Kingdom, with radio and TV stations tuning to its chimes to welcome the start of the year. ITN's "News at Ten" opening sequence features an image of the Clock Tower, with the sound of clock's chimes punctuating the announcement of the news headlines. It has done so, on and off, for the last 41 years. 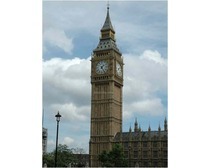 Turret clocks seen around the world have been inspired by the look of the Great Clock of Big Ben.